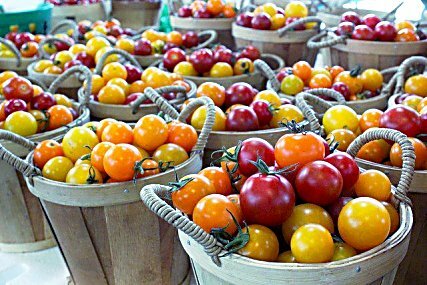 A new season of the Glenwood Downtown Market begins Tuesday in the same location, Centennial Park at Ninth Street and Grand Avenue, and runs from 4-8 p.m. The market will continue for 14 weeks, rain or shine, with the last market on Sept. 9. We will be celebrating 10 years of carrying out our motto “Supporting Sustainable Community Since 2005.” We have a full market with many returning growers, artisans and gourmet local vendors along with new faces. Early Morning Orchard, Z’s Orchard, Roan Creek Ranch and Okagawa will be some of our growers along with Jim Souza’s “Just Crepes” for a delicious on-site dinner. Enjoy the musical rhythms from award-winning writer and performer Frank Martin as he takes us from the Texas swinging waltzes to Louisiana zydeco. Juicy Lucy’s is sponsoring this week’s music, which will begin at 5:30 p.m.
Christina Gore will demonstrate in her cooking for health demonstration that vegan cooking can be fast, delicious, and healthy all at the same time. The first market will include the Glenwood Springs Garden Club’s annual plant sale, and members will be there to help answer any gardening questions you may have pertaining to our local gardening. Also, don’t forget, Al Laurette will be there for the Parks Department annual tree giveaway with free tree seedlings. They will be given away on a first come, first served basis. Come join your friends, neighbors and visitors to our community at Glenwood’s Downtown Market. Enjoy snack or dinner at one of our gourmet carts while listening to great music and enjoying the local art. Vendors are accepting WIC and SNAP benefits. Visit the Glenwood’s Downtown Market website for events and information, including a list of local sponsors for our 2014 season at www/glenwoodmarket.com.